BlackDemographics.com started as a labor of love but quickly became an important resource of Black data. There is so much more we can do but we need your help. Help us serve the community by subscribing as a supporter. As a supporter you will help fund our expanded focus to significantly increase the amount of data we research, illustrate, and customize to better provide for the needs of all organizations, activists, media outlets, and governments, whose interest is to discuss ideas, serve, and benefit the African American community. As a result Black Demographics will be an even bigger vehicle for community leaders to accomplish their goals. All transactions including credit/debit cards are handled securely by PayPal. All transactions including credit/debit cards are handled securely by PayPal. 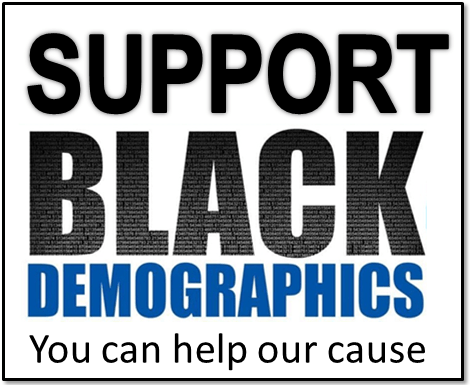 Note: Although we do important work BlackDemographics.com in NOT a 501c3 and donations are NOT tax deductible.